Point of view, in my opinion, was the biggest difference between the book and the movie. I finally read THE HUNGER GAMES last week in anticipation of seeing the movie this past Friday. What surprised me most about the cinematic interpretation was its point of view. I won’t share any spoilers, but if you want to be totally surprised by the book or movie, go check out this point-of-view post instead. 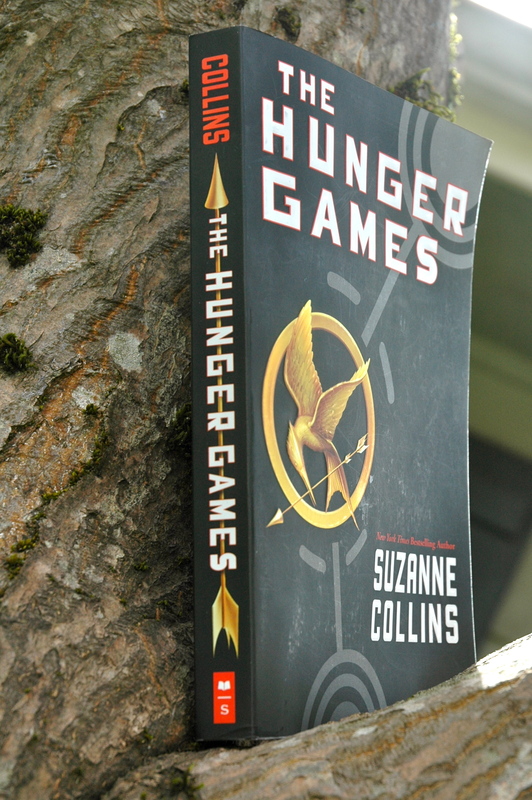 Suzanne Collins’ young adult novel is written in first person present tense. Katniss Everdeen is not only the protagonist, but she’s the eyes through which the readers see the world of Panem. We travel through the dystopian reality with her as our guide. The movie, however, takes a much broader approach. It’s omniscient. We follow Katniss through the arena, but we also watch the Gamemakers’ decisions, Haymitch’s attempts to win sponsors and President Snow’s machinations. Being privy to what’s happening in the arena, on TV and behind the scenes gives movie-goers a strong sense of the horrible pageantry that the Games deliver. It was especially cool to watch the Gamemakers manipulate the various dangerous elements on screen. One of my favorite moments was flashing to District 11’s riot after the Rue scene. Those scenes would have been impossible if the movie had stuck with Katniss’ point of view exclusively. But what’s missing from THE HUNGER GAMES movie–and admittedly my reaction is colored by my identity as a reader, not a movie aficionado–is why the Games exist. My friend Priya saw the movie without reading the book. “I didn’t understand why the kids had to kill each other,” she said. And that’s the risk that the movie takes delivering the history of Panem and the Dark Days through the impersonal omniscient viewpoint, instead of through Katniss’ perspective. In the movie, the information is set up with a short piece of text at the beginning, and elaborated on in a propaganda film shown before the reaping, but it’s presented as the facts of this world, without much emotional context. Put another way, we hear the Capitol perspective, which is obviously unconvincing, and hence, my friend wasn’t convinced. In Collins’ novel, we immediately distrust the government due to being in Katniss’ point of view. We see her supporting her family and caretaking her sister. We see what the government has done to its people. A ruling class that creates a society where residents are starving, and where spirited young people like Katniss and Gale must break the law to feed their families, causes readers to be anti-government from the beginning. The fact that the Hunger Games pit children against each other is a terrible outrage, but it’s also an extreme byproduct of the Capitol’s tight-fisted approach to ruling Panem. The Games are representative of how the government has terrorized its districts. It’s not the only outrage. In the movie, the Capitol’s role in creating these impoverished communities is glossed over. We witness Katniss’ everyday reality in District 12 but don’t fully comprehend the government’s culpability. Instead we see the exaggerated fashions and appetites of Capitol dwellers. It is implied that these appetites, and the passion for spectacle, keeps the Games going each year. But without the historical background that Katniss gives us in the book, the senseless brutality seems intended merely as a shocking plot device instead of as an extreme act by the ruling class to keep its authority intact. I should add that Katniss’ point of view in the book isn’t riddled with anti-Capitol rhetoric; in fact, quite the opposite is true. Her understated commentary is believable and gripping because it’s so matter-of-fact. “When I was younger, I scared my mother to death, the things I would blurt out about District 12, about the people who rule our country, Panem, from the far-off city called the Capitol. Eventually I understood this would only lead us to more trouble. So I learned to hold my tongue and to turn my features into an indifferent mask so that no one could ever read my thoughts. We see this mask portrayed in the movie but we never learn why she stays quiet. Do we need to know why in the movie? Probably not. But it’s this kind of first-person moment that teaches me about the story world’s politics in a deeper, more meaningful way than an omniscient movie could deliver. Have you read the book and/or seen the movie? What do you think about the point of view shift? Is third person more cinematic? Do you prefer one version over the other? This entry was posted in Books, Plot, Writing and tagged film adaptation, movie vs. book, narration, point of view, Suzanne Collins, The Hunger Games. Bookmark the permalink. I loved the movie, but it`s true that with the book, you get a more intimate grasp of the story. I did like the scenes where it showed the workings of the games. I found it interesting and I was like aha so that was what they were thinking when Katniss was burned out of the one area of the woods. Definitely with the book, the emotions were stronger. The movie was a great portrayal of The Hunger Games (And I loved getting a visual of the different settings), but it won`t measure up to first-person Katniss. I agree! The behind-the-scenes gaming bits added a fun, cinematic dimension. It seemed like the Gamemakers were trying to manipulate the outcome in a way that wasn’t as obvious in the book. But I definitely missed that close-in connection with Katniss, and I think my friend did too in not connecting to the why. Well said, Emerald! What I liked about the movie had to do with the different points of view, but as far as an authorial stance, the first-person Katniss perspective gave more of a sense of what was at stake. as I feel we never get a well rounded view of what’s going on when you have to rely on the opinion of one person. That’s a good point about the limitations of first person, Emma. It was my first love, as a writer, though, and although I’m now working in third person, I still love reading first-person novels. (I’m also the kind of reader who will excuse a slow plot if the characters are interesting!) Did you like the movie better than the book? I loved Twilight and that was told in the first person. I guess if a book’s good enough it doesn’t matter much. I liked the movie as much as the book; I enjoyed them both. Someone on Google+ said the third book in the Twilight series was told in alternating viewpoints. Interesting that the series starts out all in first person. And yes, if a book is well-written, I’ll follow the voice or characters or point of view no matter where they take me! I really liked both. I also read it quickly before watching the movie, and I loved both the first person POV that we had of Katniss, her feelings and the emotional connection is much stronger. However, like other’s have said, I loved seeing the machinations of the capital, I thought they did a great job of filling in the details that you miss in the book (like why they started the fire, etc.). I think there are just too many good things about both that it’s one of those that you can’t say “the book is better!” or “the movie is better!” they are both great, each having their own strengths and weaknesses – they are really just better together. Great point about the fire in particular, Heidi! The movie made the reasons behind it very clear; in the book, we hear Katniss thinking about why the fire was started, likely to flush out the hiding tributes like herself. And yes, I totally agree. They’re best as companion pieces. The movie lost that extra heartfelt dimension that Katniss’ perspective brings to the book, but it also took us places that we couldn’t go in the book. There’s a cartoonish element to the movie that keeps it from feeling too horrible. I don’t know how many people have seen the 2008 movie, Blindness, but I think that film can be used to treat Clinical Happiness, if ya know what I mean. There’s definitely an aspect to Hunger Games, and, really, many of the YA dystopians, that keeps them from feeling truly horrible. By comparison, you read something like Atwood’s Oryx and Crake and The Year of the Flood, and it sticks to your skin, this despair you can’t wash away by closing the covers. Well said about the cartoonish element. I was worried about seeing all the bloodshed, because I’m really sensitive to stuff like that, and I came out of the theater unscathed. I haven’t read “Oryx and Crake” or “The Year of the Flood.” But you explain that feeling of despair so beautifully. That’s one of the things art can do, yes? It’s not always a comfortable experience to read a book or watch a movie, but despite the subject matter, “The Hunger Games” wasn’t depressing. interesting perspective. great post. it’s hard to think about a movie differently when you already have so much information from reading the looks. you forget what the experience must be like for someone who’s never read the books.there’s always so much more emotional depth in the books, i find. i have a friend who’s gone to all of the harry potter movies and yet has never read a single book. i can only imagine how confused he must feel trying to figure out what’s going on with how much they have to leave out, but then he should have read the books! Hey Laura! I love reading your thoughts about this here. I read the books in a snap, just before I saw the movie. So interesting to see how it was brought to screen and the decisions made on what to put in and what to leave out. Difficult choices and I wondered what it would be like for someone who hadn’t read the books. Interesting, with Valeri’s post above, I have not read any of the HP books, but have seen several of the movies and never ever felt lost, even when I missed one of the movies and saw the next. Hey, Jackie! Thanks for your thoughts. It was a great writing exercise to walk out of the theater thinking about how the movie worked differently than the original text. Another person commented on Google + that his wife (who hadn’t read the book) had the same problem my friend did–not understanding the reason for the games in a way that felt solid enough.